Cosmic Adventure is the sixth attraction in Mario vs. Donkey Kong: Mini-Land Mayhem!. The new features in this world include flashing blue surfaces that allow the Mini Marios to walk on walls and ceilings, as well as brown blockers the player can rotate. Several spaceships and planets can be seen in the background of the levels. Enemies here include Thwomps, Sparks and Piranha Plants. 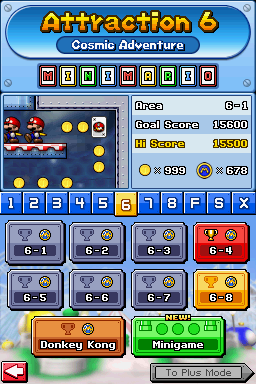 Like the previous level, a Mini Peach, a Mini Toad and a Mini Donkey Kong must be rescued in 6-4. 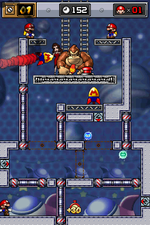 During their fight against Donkey Kong, the Mini Marios must make their way up to three rockets using the blue surfaces and brown blockers and throw them at the ape. As for Donkey Kong, he attacks by pressing a switch that changes the location of Spark generators. When successfully beaten, he takes Pauline again and flees to the seventh attraction. This page was last edited on June 29, 2018, at 09:30.